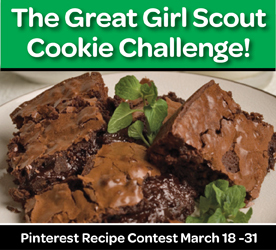 GSNI Announces The Great Girl Scout Cookie Challenge! Pin photos of the food you made using Girl Scout Cookies. Make sure you put the recipe in the comments or link to it in some way and include #GSNICookieChallenge in your post. Each recipe will count as one entry into the contest. GSNI reserves the right to use photos and recipes collected during this contest in other printed and digital materials. Credit will be given to people who submit recipes. In order to be selected as a winner, your Pinterest profile must be connected to Facebook for notification purposes. Entries will be accepted between Monday, March 18, 2013–Sunday, March 31, 2013. The winner will be chosen on April 1, 2013. Need ideas? Check out our idea board on Pinterest. So, let’s get cookin’! Show us what you can make with Girl Scout Cookies for your chance to win! Posted on March 15, 2013 at 2:59 PM in news	| RSS feed You can	trackback	from your own site.